I hope your Nightmare ends soon and you never have to give him another minute of your time. What can we do? God’s purpose and timing are perfect. I continue to pray for peace in your hearts, strength in the fight for justice and WISDOM for those deciding. May this journey of thousands of tears and heartache help others find peace and justice in their lives and situations. 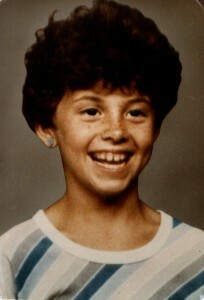 I was only 6 years old when Vicki Lynn went missing. I remember it being the very first news story that ever effected me. I’ve never forgotten her, just as so many others in the Tucson community haven’t forgotten her. It’s unreal to me that your family is still dealing with this after so many years. I truly hope you finally find some peace. I hope this comes to an end soon…you have waited so long for justice for your sister! I will never ever forget Vicki Lynn. I remember her because we shared the name. I hope and pray that you get justice. God Bless you all for keeping up the good fight. I remember this case, and the search for her. I was on 7th grade at Vail school, her cousin. Eli, was a grade ahead of me. And how terrifying it was to know she was found so close to where many of us lived. This case will forever be etched on my heart and mind. As a mom whose children were in the same age group as Vicki Lynn back in 1984, the horror of this incident has never left me. Yes, I remember Vicki Lynn. I also remember that her murderer was a “poor little rich boy” from California whose parents got him permission to stay under their roof, and pledged to the CA court system they would keep him at home and he would not ever victimize another child. You see, he had already victimized other children prior to his taking Vicki Lynn. He told one fellow inmate in CA that the “next time” he wouldn’t let his victim live. The man should have already been executed. It won’t bring Vicki back, but he won’t be around to victimize another. I will never forget your sissy. I was a special needs driver at the time. As I was assigned to my clients, in between,I would pray and watch everything that passed me, walking, driving. MY justice be served, rest in peace…little one, God bless you all! I have never forgot Vicki Lynn. I live a few blocks from your grandparents and I think of your family every time I drive by their home. I think that Atwood is a sick person and his execution should be slow and painful! I am so glad that you have been able to become the woman that you are. I commend you and your family. Hugs and may God continue to bless you all! I was there at your Sisters service I took my niece Angie she went to school with you she knew her and wanted to go. I watched every News story. I have always kept you and your family in my prayers. Email me if you don’t recall Angie and I can connect you with her. I will never forget Viki Lynn. I was 15 in 1984. Years later I met a relative in Uniforms Plus, he was getting t-shirts for racing. It breaks my heart that your family is still fighting for Viki’s justice. Your family is in my prayers. I have never forgotten that dear little sister of yours! I am praying that your nightmare will soon be over! Vicki Lynne disappeared shortly after I moved to Tucson. I have always remembered that sweet little girl and the family that was so devastated by her loss. We all had “Remember Vicki Lynne” bumper stickers on our cars. I hope the court upholds the death penalty. In my never to be humble opinion, this murderer has been alive was waaaay too long. I just read several of your posts…I find them very sad as I cannot imagine your grief…yet I find them very inspiring as well…I will keep my fingers crossed for you and your loved ones that this nightmare finally comes to an end…and soon! I, too, hope that this is the beginning of the inexcusably-long end for you and your family. My name is Bret Linden. I recently celebrated my 38th birthday, and I have resided in Tucson, Arizona, since 1980. I spent a lot of time growing up in the Flowing Wells section of Tucson. I lived there when Vicki Lynne Hoskinson was kidnapped and later brutally murdered by Frank Jarvis Atwood. I was 10 years old at the time. I attended Laguna Elementary, which was the next school over from Homer Davis, where Vicki attended school. Vicki was about a year younger than me. Other than later having attended school with Vicki’s sister, Stephanie, I did not personally know the Hoskinson family. However, being so close to Vicki in both age and geography, her case touched and affected me deeply…as it did for many who lived in the Flowing Wells community at that time. I remember the once-calm neighborhood coming together, both out of fear and a desire to support one another during this horrible time. I remember being reminded by my mother and some of my teachers to not talk to any strangers, and being given constant refreshers in how to handle a stranger situation were I ever to be approached. I remember the manhunt for Frank Jarvis Atwood, and his subsequent arrest. I remember following his trial in the newspapers. I remember feeling a little relived at the guilty verdict, and being satisfied with the sentence of death. That sentence was handed out 25 years ago this month…a quarter of a century…and Vicki’s family and this community are still waiting for Atwood’s sentence to be carried out. Again, because I lived so close to Vicki and was so close to her in age, I think of her from time to time, but I’ve been thinking of her more in recent days with the upcoming 25th anniversary of Atwood’s sentencing, combined with the stories of Isabel Celis being missing and the recent execution of Thomas Kemp (whose sentence took only 19 years to carry out) being on the front pages of the newspapers. I understand that right or wrong, good or bad, the legal system is plagued with foot-dragging and red tape, and that “the wheels of justice turn slowly”. However, even with those things considered, and comparing Atwood’s case to other death penalty cases in Arizona, I just cannot understand or justify how or why Atwood is still living. What’s worse is that, to the best of my knowledge and research, Atwood’s execution is not going to happen any time in the foreseeable future. My confusion around Atwood’s sentence having yet to be carried out has led me to the internet in search of some sort of explanation. My research has reminded me of many details of the case, and that raised more questions than answers. When Atwood murdered Vicki, he was currently on parole from California, having been previously convicted of sexually assaulting another child. The pink paint on the bumper of his car matched that scraped off of Vicki’s bicycle. A teacher who had wrote down the license plate number of Atwood’s car puts Atwood near the scene of Vicki’s abduction. I won’t revisit each and every detail of the case in this letter. My point is that, while I acknowledge that I have never attended law school, the case against Atwood seems solid. My research of the old case stories reveals nothing from the defense that would provide reasonable doubt. I have to believe that any potential juror in any sort of potential retrial would see the case as solid as I do, making any retrial a waste of time and resources. What my research also revealed was that Atwood, after he murdered Vicki, was able to wed and earn a college diploma. My thoughts immediately turned to what a crying shame it is that Atwood was able to have those life experiences, but Vicki was not. Since Vicki would be close to my age had she not been murdered by Atwood, I compared the positive experiences and milestones in my life to what Vicki may have experienced by now. Because of Atwood, she never got to experience any of them. In my mind this compounds the injustice surrounding the Atwood case. I am unable to make sense of this situation or find explanations or answers that might help me make sense of it. So, my quest for answers has compelled me to write to you. I understand that you only recently took office. However, if there’s anyone in this state who understands why Atwood’s execution has been delayed for as long as it has, it would be you. I understand that you’re a very busy man. While I would greatly appreciate a response to my inquiry, I could also understand an inability to find the time to respond to this letter, especially a letter sent from someone who has no involvement in the case beyond being a concerned Arizona citizen and member of the community. If nothing else, I hope you take from this letter that there are still people in this community who still remember Vicki’s case, and feel it is wrong that Atwood’s sentence has yet to be carried out. Hopefully you will use the power of your office to set this wrong right and expedite Atwood’s execution, thereby providing Vicki’s family and the Tucson community the justice and closure that they deserve. Our thoughts and prayers have been with over these many years. Justice for Vicki Lynne and her loving family. I will be thinking of all of you and following this. Love and prayers to you. The love of a big sister, family and many hearts and communities await an end. Please Lord let it be on June 7th. It makes me sick to my stomach knowing that Atwood is still trying to appeal this instead of repenting and asking God for forgiveness. This is truly telling of his present and past demeanor and Atwood would come out and do it all over again! I pray that these judges see through him! Enough already! We should file petitions to our congressmen. Hopefully it will speed things up. I was shocked to hear that he is still alive. It makes me angry, that all this time. We are paying to keep him alive. I would like to help. Our hearts and prayers reach out across America for the family of this beautiful little angel with an adorable smile. I wish I had the right words to say, but I will try. I was 10 when the most horrific event happened in your life. I remember laying in my bed crying. Not necessary for Vicki, although I imagined her suffering was a hurt no child should experience, I cried for your family. At a very young age I had compassion. In fact I have been given the ultimate blessing to help children and families as a school counselor for the past 8 years. In fact, I was on the crisis team when Isabel Celis went missing, to comfort her 1st grade class and give some reassurance to her friends and classmates that it won’t happen to them. This is not about me, but just a reach out to you, that Vicki and your family have never been forgotten. Part of my wanting to help children and families stems from Vicki and her legacy. I am 43 now, and I spend everyday celebrating the truth of life. You are right, purpose is everything. All we can do is to appreciate every second that we have, and every breath we take. Merry Christmas! May 2018 be a new beginning of hope, inspiration, and miracles.